The Magazine of the Week is the December 1963 issue of Analog magazine (formerly known as Astounding), containing the first appearance of Frank Herbert's landmark novel Dune. In the early 1960's, before Dune appeared, Frank Herbert was regarded as a second-tier science fiction writer at best, having published only one novel and a couple dozen short stories. When he wrote Dune, it was rejected by every major SF book publisher. It was too long, too confusing and too strange, the editors agreed. 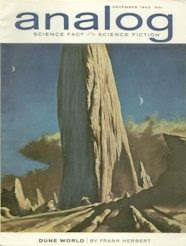 The dissenting voice was John W. Campbell, Jr., who saved the novel (and perhaps Frank Herbert) from possible obscurity by purchasing the rights to serialize Dune in Analog, beginning with the Magazine of the Week. Campbell published the first portion of the novel in three parts under the title Dune World. Even though it was only part of a novel, with no real resolution, Dune World was an instant success, receiving Frank Herbert's first Hugo Award nomination. After the readers' positive reaction, Campbell published the rest of the lengthy novel in five more installments, under the title The Prophet of Dune. 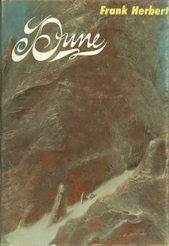 The success of the magazine version helped Frank Herbert's agent to find a hardcover publisher for the book, and Dune became one of the most successful SF novels ever printed, both commercially and artistically. It was filmed with mixed results by David Lynch in 1984 and by John Harrison for the Sci-Fi Channel in 2000. John Schoenherr's cover for the Magazine of the Week really doesn't do justice to the fascinating world Frank Herbert created in Dune, but not to worry--John Schoenherr ended up making a career out of cover art for Dune and got much better with practice. He did the cover art for the first part of The Prophet of Dune serialization, which was also used as the cover for the first hardcover edition of Dune, next week's Book of the Week. 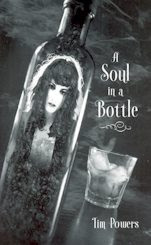 "A Soul in a Bottle" by Tim Powers is a book of novelette length from Subterranean Press, copyright 2006. My copy is the deluxe hardcover edition. It has wonderful black & white illustrations on the dust jacket and in the interior by J.K. Potter. The print is large enough to make it run 82 pages. This is probably not something you'd find shelved in the average book store; it's a specialty item for collectors and Tim Powers fans such as myself. The story goes like this. I think the cover is a bit misleading. In Hollywood, at the Chinese Theater, book trader George Sydney encounters a striking red-headed woman. They share poetry quotes and then a kiss. George longs to see her again. When he does, before they can go to a bar for a drink, she literally disappears. George has fallen in love with a ghost. She, he learns, is the poet Cheyenne Fleming, who accidentally shot herself back in 1969. Cheyenne was angry with her sister Rebecca. Cheyenne wants George's help so she can go back to the past, so she won't have died. "A Soul in a Bottle" is colorfully told, and memorable. George apparently drinks and Cheyenne isn't an angel. It's not your typical ghost story or love story. I'd recommend as a good, short read. Aaron's Book of the Week :: The Thing from Another World by John W. Campbell, Jr. 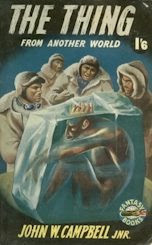 The Book of the Week is The Thing from Another World, a collection of short fiction by John W. Campbell, Jr. While John W. Campbell, Jr. is best remembered to fans of literary science fiction as an influential editor, his greatest direct impact on pop culture was writing the story "Who Goes There? ", which Hollywood filmed as The Thing from Another World in 1951 and again as The Thing in 1982. The Book of the Week is a paperback reprint of the hardcover first edition titled Who Goes There? (1948). While the original hardcover edition predated the first movie, this paperback edition came out afterwards, and the book's title was changed to take advantage of the movie's success. This paperback edition was published by small British publisher Fantasy Books in 1953 (I think -- there is no date listed on the book). Since it appeared only in England with a small print run, this book is actually more difficult to find than the hardcover first edition; on the other hand, unlike the hardcover, it doesn't cost you $500 if you do find it. Before he reshaped the genre of science fiction as editor of Astounding magazine, John W. Campbell, Jr. was an important influence on the field through his own writing. While he wrote traditional space opera under his own name, the moody and stylish stories he wrote under the pseudonym Don A. Stuart were his most ground-breaking works. The seven stories in the Book of the Week were all originally printed under the Don A. Stuart byline between 1934 and 1938, and they comprise much of Campbell's best fiction. It is sometimes said that by the early 1950's Campbell had ceased to be an important influence on the field of science fiction. It is certainly true that in the 50's and 60's Campbell did not dominate SF as he did in the late 30's and 40's; however, the idea that he was no longer doing important work as an editor is belied by a single novel that he purchased and serialized in Astounding after every major book publisher had turned it down. The first installment of this landmark novel is next week's Magazine of the Week.